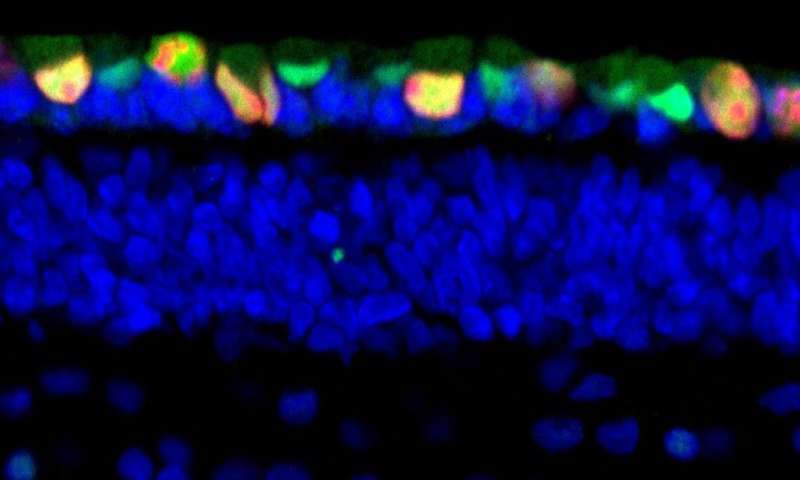 Investigators at Children's Hospital Los Angeles have been able to pinpoint the exact stage of development of the human retina, when cells can grow out of control and form cancer-like masses. The finding could open the door for future interventions in retinoblastoma (RB), a tumor of the retina that affects children under five years of age. The investigation represents the first of its kind by identifying the phase of human retinal development when specific cells—called cone precursors—may turn cancerous. Following up on the 2014 discovery with the current study, the team found that at a specific point in their maturation, human cone precursors cells can enter the cell cycle—this is a series of events leading to their division. The cells then begin to proliferate and form pre-malignant lesions that can develop into rapidly growing retinoblastoma-like masses. The maturing cone precursors enter the cell cycle in response to the inactivation of the RB1 tumor suppressor gene and loss of functional RB protein, which regulates cell growth and keeps cone precursor cells from dividing.